I love dioramas. When I visit museums, I want to shrink to miniature size and climb into one of magical tiny worlds and explore. 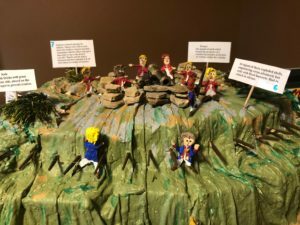 When I was a student, I loved to build dioramas, and when I taught high school history, I loved to offer dioramas as project options for my students. In my 2015 book, The American Revolution: Experience the Battle for Independence, I include suggestions for how to build a model of a redoubt. This kind of earthwork fortification was used by the British Army to defend Yorktown, Virginia in 1781. My guidelines are very basic. 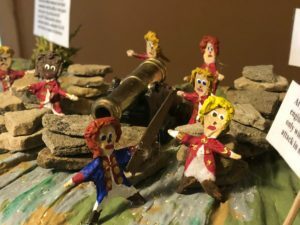 So, in preparation for a recent author talk about the life of a Continental soldier, I updated this activity into a full lesson plan and built my own diorama of a redoubt to illustrate some challenges soldiers faced in the Revolutionary War. Adapt this lesson to your content area and grade level. You might just fall in love with dioramas too. History inquiry begins with asking what you want or need to know. Write a question to guide your research. My question: What were the key British land defenses during the Battle of Yorktown in 1781 and how did the Continental Army managed to breach them? 2. Research: Start with solid secondary sources, but then introduce students to primary sources. Teach students how to interrogate a source by identifying the author, date, and purpose of a document and evaluating the author’s claims and supporting evidence. I read lots of sources about the Battle of Yorktown. Two primary sources I relied on were A Narrative of a Revolutionary Soldier: Some Adventures, Dangers, and Sufferings of Joseph Plumb Martin, by Joseph Plumb Martin and Elements of Field Fortification by Louis Locheé. Depending on the age and ability of your students, you may have to select excerpts of primary sources that are within their reading level. In American Revolution: Experience the Battle for Independence, I define a thesis statement as “the main point or main conclusion a historian makes after researching a specific question.” Thesis statements are hard to write, and I’d suggest practicing a lot with students, crafting statements as a class and individually, before they write their own thesis for a project like this. For any major project, I asked my students to write multiple drafts of their thesis statements and submit them for peer evaluation prior to my evaluation. My thesis: The key British defenses at Yorktown included basic 18th century technology of earth and artillery, branches and barricades; but the Continental Army breached British defenses with an offense that was just as basic—shovels and axes, darkness and delusion, and bayonets and bravery. 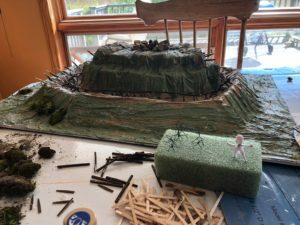 Before your students begin to construct their dioramas, tell them how you will evaluate their work. How will you assess the students’ support for their thesis? 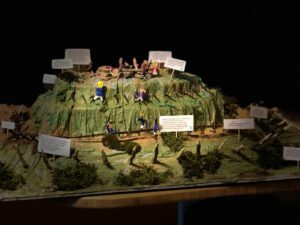 Should the diorama have multiple sections as part of the display? Do you require items be labeled/described? 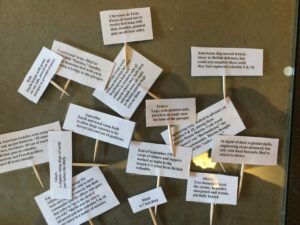 How should students weave in textual evidence from primary sources? A clear and specific rubric should be a recipe that students can follow to meet your standards. 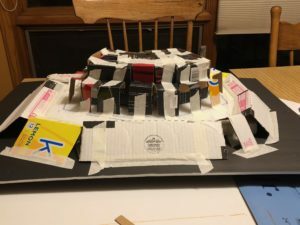 Have students prepare a blueprint or rough sketch of their diorama design before they begin construction to assess how well their proposed project will support their thesis. 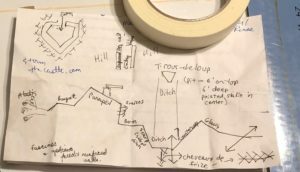 Have classmates evaluate each other’s blueprints for clarity and support of thesis. 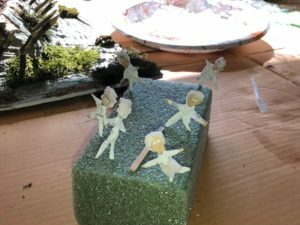 Show students examples of historical dioramas that meet your expectations and let them brainstorm the materials best suited to their designs. 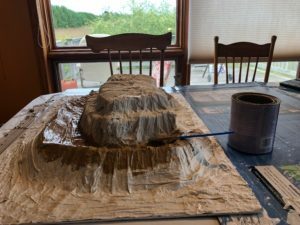 Below is my process. 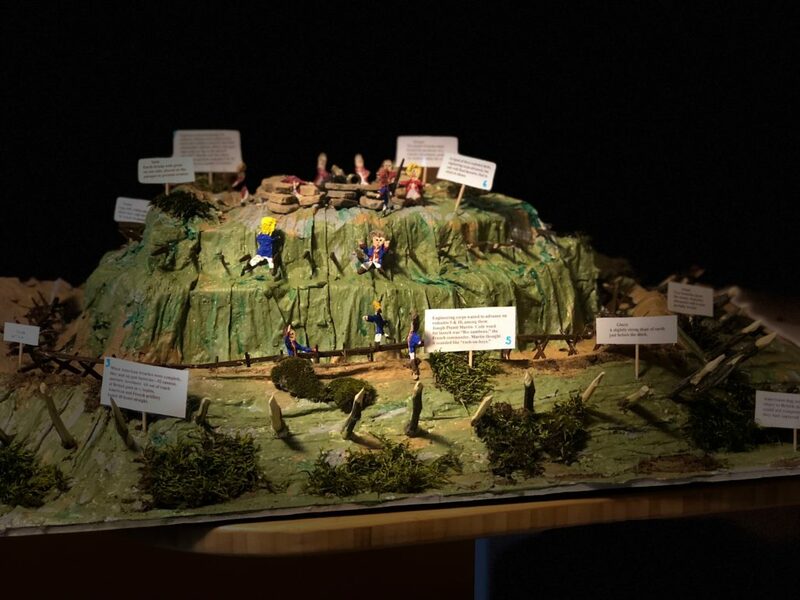 A diorama is a scene and your students should be the narrators of the action they have put on display. Ask them to present their dioramas, beginning with their thesis statements and explaining how their dioramas support their research conclusions.